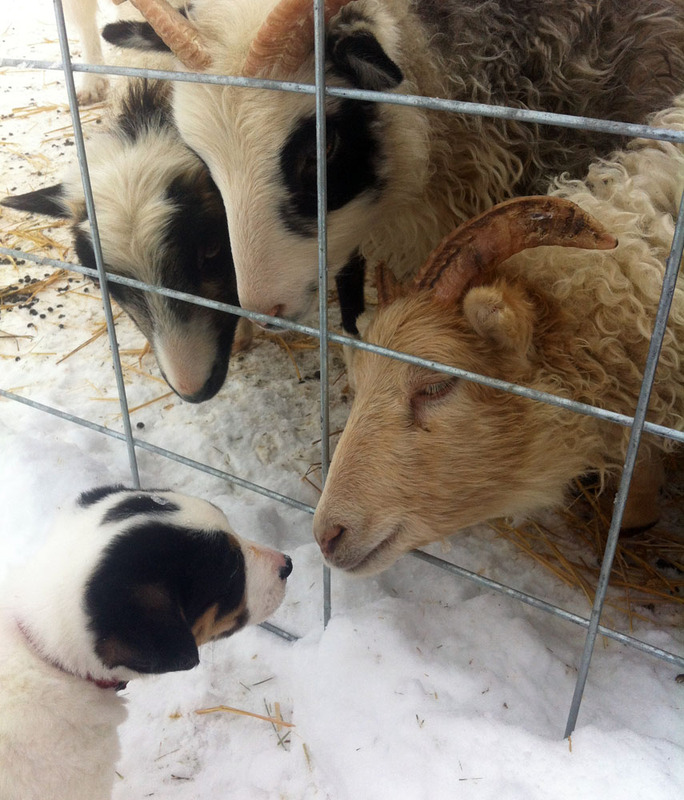 It has been almost six months since we brought Lulu home to begin training her as a guard dog for the Sheep. She is a couple months away from turning one year old so still a long ways off from being out of the puppy stage but her guarding instincts are strong. Lulu has been rather lonely since the Sheep started breeding with the Ram and she started roaming off of the farm to play with the neighbors dog Dora. We have been thinking about getting a Border Collie for awhile to help with herding the Sheep and to have a companion for Lu, but the ones we found were either gone before we had a chance to see them, or just bad timing. When we put the word out that we were looking on our local farm exchange we almost instantly found some a couple miles down the road from us. We went to see them on New Years day and picked Bella out of the three puppies that were left from the litter. Bella is 1/8 bulldog which the breeders said would mellow out the Border Collie breed a bit. She was born just a couple weeks after Malcolm so still incredibly puppy like and too tiny to be outdoors by herself in this icy wonderland we have on the farm right now. Luckily her and Lulu seem to becoming fast friends. We want her to be mostly an outdoor dog so we get her out as much as we can and we introduced her to all the other farm animals yesterday. We will be moving the Sheep constantly come spring so we are hoping to start the almost two year training process soon which will make our intensive rotational grazing system that much more closer to a reality. We would also like to add on a couple of Cattle to make the most holistic grazing system we possibly can but for now we have two puppies to train, chicken tractors to build, and our first lambing season to look forward to while keeping our family and growing farm warm and fed.